Tiled surfaces are ideal throughout any building. Durable, aesthetically pleasing and suitable for all dry, wet and hygiene areas. In areas like showers, bathrooms and kitchens, the humid conditions together with soaps and food residues can be the perfect environment for bacteria, mould and mildew to survive and thrive. Microban technology helps keep bathrooms, showers and all tiled environments cleaner and fresher. Only BAL’s range of grouts and sealants developed exclusively with global leader Microban technology will provide protection against black mould AND potentially harmful microbes and bacteria. Because the Microban technology it is in-built within the BAL formulation’s, Microban protection provides continuous antibacterial and antifungal protection that lasts the lifetime of the products, helping to create a cleaner, fresher and more efficient building application. Other products in the UK market promote hygiene ranges of grouts and sealants but these only actually claim to be anti-mould. 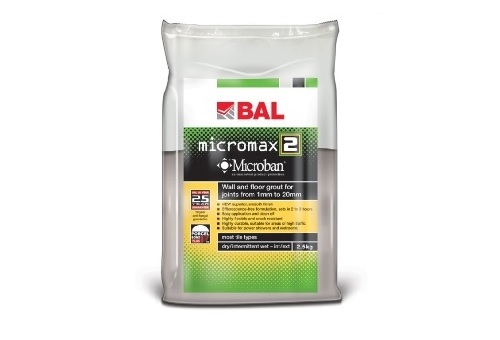 They do not offer the anti-bacterial and anti-microbial properties of BAL’s Microban range of grouts and sealants; including BAL Micromax2, BAL Microflex and BAL Micromax Sealant. Alex Underwood, Head of Marketing at BAL, said: “As market-leaders in full tiling solutions, we are proud to offer a range of innovative products such as grouts and sealants with in-built Microban technology. “We are the only tiling brand in the UK to offer finishing products which can provide protection against black mould AND potentially harmful microbes and bacteria. “When microbes and bacteria come in contact with the product surface, Microban protection penetrates the cell wall of the microorganism and disrupts the cell, making the microorganism unable to grow and reproduce.